Is there anyone who wants to see wrinkles in his/her face? Well I guess the answer is NO. 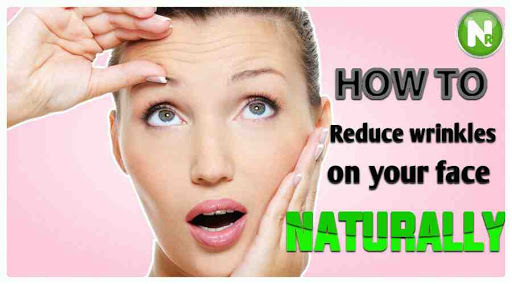 Instead of trying products that may or may not work, why don't you learn the causes of wrinkles and take steps to reduce wrinkles on your face naturally. This may even delay the appearance. First of all What are Wrinkles. wrinkles are folds in the skin. Wrinkles appear on the skin as you age when aging skin starts to lose its ability to hold on moisture, makes less oil, and is slower to heal. It also produces less collagen, and because collagen is what makes your skin smooth and elastic, wrinkles start to appear. Normal aging changes in the skin: Aging naturally causes a slowdown in collagen and elastin production. With aging also comes a loss of fat in the face, and looser and thinner layers of skin that add to the appearance of fine lines. Remember that you cannot stop the clock, but you can slow down the process by several ways, so keep on reading. Smoking: Smoking curbs your skin’s production of collagen, which keeps your skin from sagging and forming wrinkles. The downturn in collagen paves the way for wrinkles. That is one more reason to quit smoking, or never to start. Sun exposure: It is the No. 1 cause of wrinkles. Getting too much sun damages your skin. Dehydration: dry skin appears more wrinkled, the same way dry soil looks like after a drought. When you do not get enough sleep, the body produces excess cortisol, a hormone that breaks down skin cells. While when you get enough rest, your body will produce more HGH ( human growth hormone), which helps your tissues remain thick, more “elastic,” and less likely to wrinkle. Instructions: Mash the banana well and add the rest of the ingredients and blend them well until you have a smooth paste, if necessary you can add more oatmeal also.Apply this paste on your face and neck gently, and relax for 20 minutes. Then wash with warm water and pat dry with a clean towel. Finally, tone and apply a moisturizer. Grapes are filled with alpha-hydroxy acids – the ingredient found in much skin firming and anti-aging creams. Therefore; regular use of grapes is believed to control wrinkles. Instructions: Cut a green seedless grape in half, and gently rub it on your face. Leave the mask on your face for around fifteen to twenty minutes before washing it off with cold or warm water. Gently pat your face dry. You may then apply a moisturizer. Your skin simply looks better when moisturized; since a moisturizer makes wrinkles less visible to the naked eye. That is the secret behind instant results when using most of what is called “miracle” moisturizers. On the other hand, there are moisturizers that boost the production of collagen. Look for the ones that contain Alpha-hydroxy acids (AHAs). These natural fruit acids lift away the top layer of dead skin cells, reducing the appearance of wrinkles, they also stimulate the production of new collagen. Other ingredients to look for are peptides that help promote the production of new collagen. When combined, AHA’s, peptides, and antioxidants from the best moisturizer for your skin. If you prefer more natural moisturizers, organic oils are a good option for you. Oils like coconut oil, olive oil, and argan oil, all contain antioxidants and have been used for centuries for protecting the skin and fighting wrinkles. For me, I prefer argan oil, as my skin absorbs it quickly. But you can choose from a wide variety of oils, just make sure it is labeled “organic”. It will protect you from skin cancer, and help reduce wrinkles at the same time. So stay out of the sun between 10 a.m. and 4 p.m., and make it a habit of wearing sunscreen every day with at least 30 SPF, even in winter when it is cloudy. When wearing a sunscreen, make sure to apply an eye cream that contains an SPF, the skin around your eyes is so delicate, and tends to wrinkle before the rest of your face. It is an awesome source of an essential fatty acid known as Omega-3; which helps nourish skin and keep it plump and youthful, eventually helping to reduce wrinkles. According to Mayo Clinic, “Green tea extracts are the ones most commonly found in anti-aging creams”. Green tea is superior in delivering antioxidants and reducing wrinkles. Retinol is a natural form of vitamin A found in many anti-aging creams. It is the only ingredient that works on a molecular level by exfoliating the skin and increasing the production of collagen. Water, fresh fruit juice, and tea are all great sources for keeping your skin in good condition. If you always forget to drink water, like I do, you can install an app on your smartphone for reminding you to drink water. Fruits and vegetables contain antioxidants; compounds that fight damage caused by free radicals (unstable molecules that can damage cells), which in turn helps you look younger and more radiant. Make sure that each meal contains at least one kind of fresh fruits and vegetables. It is never too late to start taking a good care of your skin, experts say that the best ways to reduce wrinkles are sun-protection, nutritious diet, regular exercise, a stress-free lifestyle, using anti aging creams that contain Retinol and proper sleep. If you spend $$$ annually in the search for miracle beauty products, eat right and live a healthy lifestyle. Rather than trying to reverse the effects of time, try preventing wrinkles in the first place.